In June, I was thrilled to receive news that my dissertation (supervised by Dr Charlotte Nicklas) had been nominated for the Design History Society Undergraduate Essay Prize. A few weeks later I found out it had won. The essay looked at hand-knitted bathing suits in the 1930s, with a focus on their making and wearing for the leisure and lifestyle of young working women. In their comments, the Prize’s reviewers said the essay contained new research that explored aspects of working class dress, alongside excellent theoretical arguments. 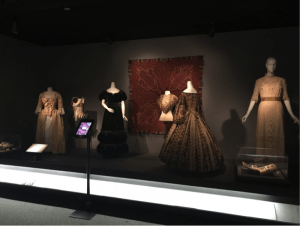 An important aspect of my research was the acknowledgement that working class dress, women’s craft and the home-making of garments is often overlooked in dress history and sometimes, also, by museums. Winning a prize for this work underlines the value of such histories and gives me confidence to continue investigating beachwear worn by young women in the interwar period. Fig. 2 Jeremy Aynsley announcing the winners of the Student Essay Prize. Fig. 3 Celebrations in front of the Statue of Liberty at the Design History Society Gala Dinner. 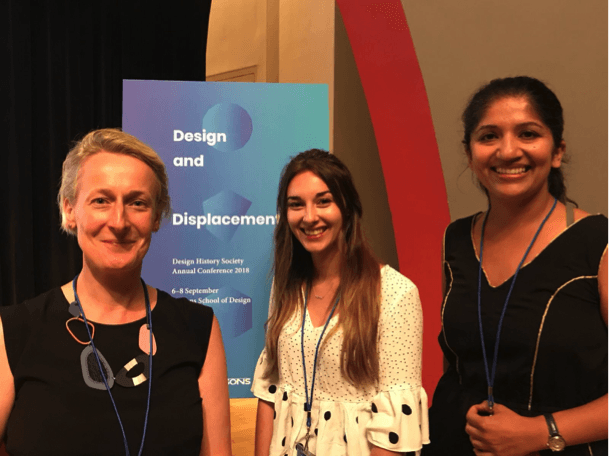 During the conference, DHS held two social events for conference delegates to network and celebrate design history. 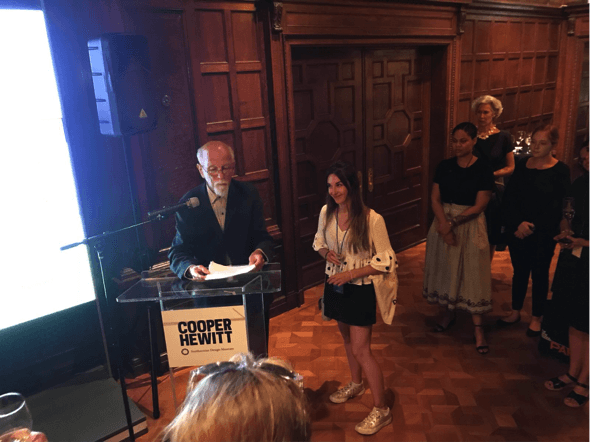 The first was an opening reception in the Great Hall at Cooper Hewitt, Smithsonian Design Museum. 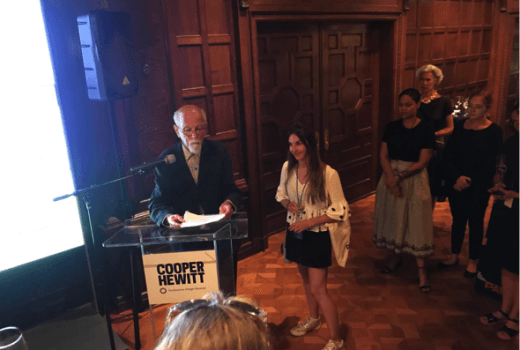 It was here that DHS chairman Professor Jeremy Aynsley formally announced the winners of the Student Essay Prize and Design Writing Prize. He spoke of how the Prize is one of the ways the Society supports and encourages the student research of design history. 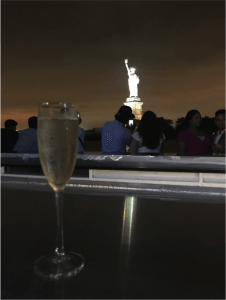 The second was the Gala Dinner, which took place aboard a dinner boat for an evening cruise to enjoy the sights of New York from dusk to dark. Over the three days of the conference, I attended sessions examining Meet me in St. Louis (1944), American Modernism, Museology, émigré designers’ clothing and displacement. These sessions were close to my interests in dress, textiles and material culture but they also explored aspects of design history that were new to me. I was particularly intrigued by Selene States’ paper “Delineating Fashions Beyond the Bauhaus: Patterning Die Neue Linie After Politics in the Weimar and Nazi Periods,” which examined the shifting design of fashion illustrations in the Bauhaus Ladies’ Journal through the Weimar and Nazi periods. Her primary research compared the illustrated designs in the journal with international journals and dress patterns; a methodology I was intrigued by and had attempted within my own research. Fig. 4 “Mended and Altered” section at Fashion Unravelled, The Museum at FIT. 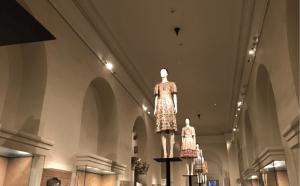 In the museology session, Colleen Hill, curator at The Museum at FIT, gave a paper examining the repurposed garments within the museums current exhibition Fashion Unravelled. Luckily, the museum was my next stop after the conference. The Fashion Unravelled exhibition looked at garments that have altered, unfinished, repurposed, distressed and deconstructed. Each garment displayed had an intriguing history relating to their wearers or makers. 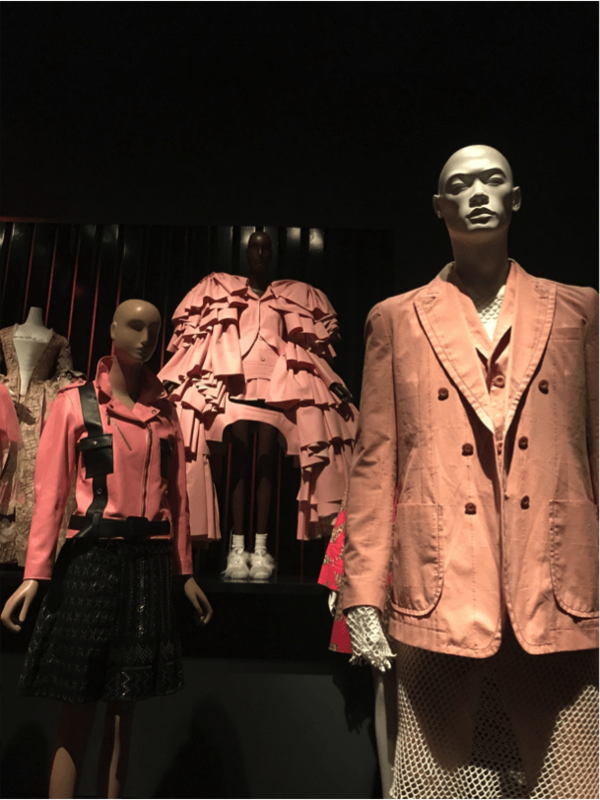 Whilst I was in New York, FIT opened a second exhibition, PINK: The History of Punk, Pretty, Powerful color, which explored the meanings and definitions of pink clothing. It was an explosion of garments in every shade of pink fabrics imaginable in Euro-American fashion from 1850 to present. It did not just feature pink frocks, as one might have expected, but also lingerie, menswear, childrenswear and contemporary garments that use pink for conceptual or political meaning. Fig. 5: PINK: The History of a Punk, Pretty, Powerful Color. Images features the juxtaposition of a 1750s Silk robe à la française and a pleather garment from Rei Kawakubo’s famous “18th century Punk” collection. Fig. 6: Dolce and Gabbana Evening dresses from A/W13-14 collection displayed at Heavenly Bodies: Fashion and The Catholic Imagination, The Met 5th Avenue. When I began my dissertation research I would never have expected it to be the start of an adventure, which would end up in New York. Emmy starts on the MA History of Design and Material Culture this month.